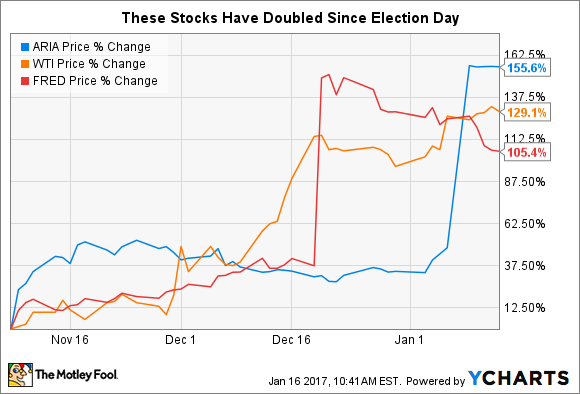 Find out why these stocks have soared during the post-election rally. The stock market remains near record-high levels, and although the big rally following the election has lost some of its upward momentum, it hasn't given up any of its hard-fought gains either. Most market participants attribute the new push higher for the Dow and other major market benchmarks on expectations that more business-friendly laws will come out of Washington in 2017 and beyond. Yet that's only part of what has led to a doubling in the stock prices of Ariad Pharmaceuticals (NASDAQ:ARIA), W&T Offshore (NYSE:WTI), and Fred's (NASDAQ:FRED) since the election. Below, we'll look at why these three stocks have doubled and whether they have more room to run higher. Ariad Pharmaceuticals enjoyed some gains immediately following the election, because the attitude among investors toward pharmaceutical and biotech companies improved. Many initially believed that a Republican victory would take pressure off companies in their fight against potential drug-price regulation. Since then, President-elect Donald Trump's comments have led some to question that conclusion. But for Ariad, an early January bid from Japan's Takeda Pharmaceuticals to buy out the company for a total of $5.2 billion gave shareholders the prospect for a $24-per-share cash payday. Ariad executives believe that the deal is a good result for investors, with an outside private equity company having fought for Ariad to make major strategic moves and claiming victory after the deal's announcement. Going forward, Ariad shareholders won't see much in the way of further gains, unless an unexpected bid for the company from a third party emerges. W&T Offshore's gains, on the other hand, came gradually over time. The offshore drilling company's prospects looked a lot better as the price of crude oil rebounded from its lows earlier in 2016, and excitement about the prospects for less regulation in the energy industry helped to drive optimism as well. News that OPEC would seek production cuts from its members made W&T shareholders confident that it could avoid slipping back into the financial troubles that it had recently experienced. Yet even that good news didn't entirely explain the huge share price advance that W&T experienced. Then in January, W&T announced that it had made a major find in its Mahogany field, showing greater depths of oil-rich geology and discovering several new areas connected to the main field that could bring in even greater production. It's unclear to what extent investors might have anticipated this good news in advance, watching and waiting for favorable drill-test results. Yet if oil prices continue to rise, successful drilling ventures will take on even more importance, and W&T Offshore has done a good job of finding lucrative opportunities with manageable costs that could produce profits in the near future. Finally, Fred's big stock price gain came from a big win for its budding drugstore business. The retailer announced in late December that it would pay $950 million to acquire 865 stores from Rite Aid (NYSE:RAD) as part of Rite Aid's deal to merge with fellow industry giant Walgreens Boots Alliance (NASDAQ:WBA). The deal would make the Fred's Pharmacy network of stores the No. 3 drugstore chain in the U.S., and it would more than double the number of locations that Fred's offers customers. Since the announcement, Fred's shares have fallen somewhat, as investors begin to question whether antitrust regulators assessing the Rite Aid-Walgreen's deal will see Fred's as a viable enough competitor to accept the divestiture and approve the merger. Unless the two drugstore giants get a favorable result, Fred's could see its stock give up all of its gains, because the sale is contingent on the merger taking place. Stocks usually take a long time to double, and these companies are remarkable in the speed with which they've gained ground. For Ariad, there's little chance of further gains, and Fred's has considerable risk of giving back ground if its deal doesn't go through. W&T has the best growth potential if its discoveries turn out as well as it hopes and if oil prices keep climbing higher.